Growing is a hungry business! Infant gorillas and chimpanzees need milk just like human babies. The babies rescued by Ape Action Africa (AAA) have all lost their families. They depend on human formula - as well as 24-hour loving care by experts - to grow strong and thrive in a safe forest sanctuary. As they grow and transition to solid food, they love pineapples! The sanctuary uses 2,200 pineapples each week for 320 primates in their care. Gorillas and chimpanzees are on the brink of extinction. Habitat loss and poaching threaten these animals. 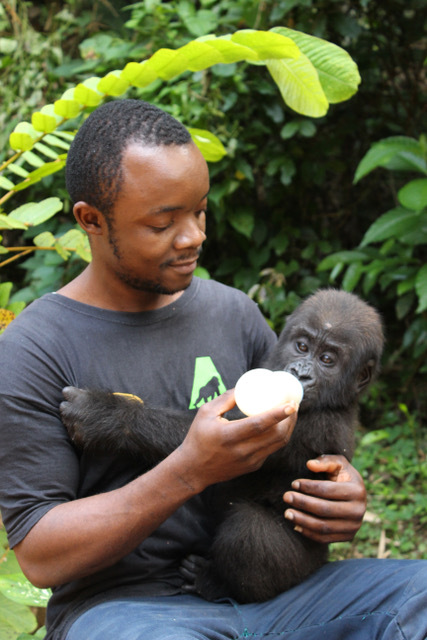 Ape Action Africa is committed to protecting Cameroon's great apes by rescuing orphaned and injured gorillas and chimpanzees and giving them a safe forest home where they can recover and then hopefully return to the wild. AAA also works with local communities to develop long-term solutions to ensure their survival in the wild. Associated organization: Ape Action Africa, www.apeactionafrica.org; https://www.youtube.com/user/ApeAction. Baby formula costs $.85 a bottle and each toddler gorilla drinks 6-7 bottles a day. The delicious local pineapples cost $.10 each.